Due to its structure, Arkon is one of the more fun and asymmetric play systems in LEDON Explore. It opens up the possibility of playing in a different way, among other things with the integrated jungle hut between two of the towers. The jungle hut is moveable, and a firm favourite with children playing hide-and-seek. One of the towers provides access via two levels to the highly popular tube slide. With a starting height of 90 cm and a built-in window that lets in light, all age groups can join in the fun. Arkon has both a swinging jungle hut and a jungle bridge. 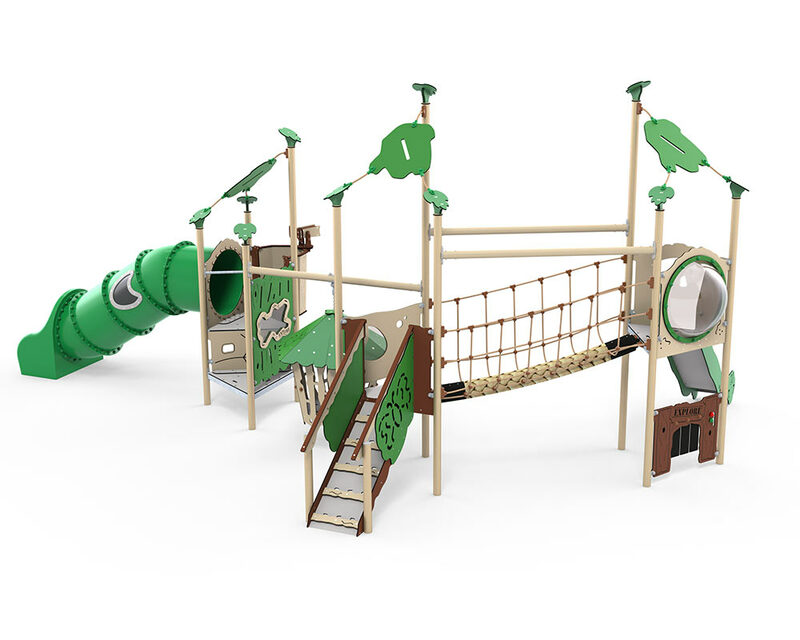 The jungle bridge demands balance and concentration, and also stimulates children’s motor skills. Balancing across the jungle bridge provides access to the tower’s dome window, from which the world can be viewed in whole new perspective. It feels as if you’re floating in mid-air. When you’re ready, a thrilling ride down the slide awaits, which is fun, and also teaches you about gravity and judging distance and speed.